Until the 1990s, the Velvet Knights (VK) brought a fun sense of humor to the drum corps activity, replete with their famous red Converse sneakers and baseball hats, unafraid to put anything on the field – including a huge rubber shark's head and a gorilla chasing a monster banana. And unapologetically intent on showing their fans a great time, VK managed to be both a perennial crowd favorite and a top-placing competitive drum corps. In 1996 the Velvet Knights went inactive. Finally, 11 years later, the Velvet Knights returned to Drum Corps International competition in Pasadena, Calif. as a Division III drum corps. Troy Emmons marched with the original Velvet Knights in the 1990s, and, as President of the Board of Directors, was instrumental in bringing the corps back to the field. "When the corps went under, I lost a part of me," said Emmons. 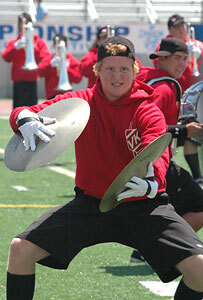 "And watching drum corps over the years, for the most part there weren't very many entertaining corps out there. All my friends and the alums kept saying, 'We should bring the corps back,' but no one was doing anything about it. So I just decided that no one else is going to do anything about it, so I took the initiative." Sometimes bringing a corps out of inactivity involves paying off old debts, dealing with trademarks, etc. In this case, Emmons says, the corps had been gone so long, bringing it back was more like starting a whole new corps. "There were no assets left of the old organization, so we had to buy all new equipment and uniforms; there was no alumni base still of age, so the whole recruiting process was from scratch," Emmons explained. "We were starting a whole new corps again. The only advantage we had is that we have somewhat of a legacy to live up to, and a fan base." Velvet Knights performance clip from the Division II & III Semifinals. The fledgling corps is, so far, managing to make ends meet, and was able to take small tours through Southern and Northern California and Arizona, and of course, finish the season on field at the Division II & III Semifinals in the corps' hometown of Pasadena. "That was one of the main reasons we were able to get started this year," said Emmons. "That was a huge recruiting point, a first-year corps being able to compete in the World Championships, and without the tremendous cost of having to travel back from the events." For the corps' 56 charter members, fulfilling the original mission of the Velvet Knights was a major draw for membership in the new VK. "It just seemed like a really fun corps," said Hillary Baca, a baritone "age-out" from the new Velvet Knights and a two-year former member of Impulse. "Have a corps that's wacky and fun; I feel like it's not really been around drum corps for awhile. I'm happy to be in the corps that is the return of the Velvet Knights." "The members are beginning to understand the tradition they're upholding," said Emmons. "A lot of the alumni have come by the rehearsals and have talked to the corps, shared their experiences of the original organization, and that has helped." In addition to an enthusiastic alumni base, the corps has enjoyed the support of the other California corps. "A lot of the staff members have worked with some of the other corps, so the camaraderie is already there," Emmons said. "Drum Corps International also has been very supportive and very helpful in getting us back on the field while letting us ask whatever we wanted. And in return they have given us good straight answers." The Velvet Knights rounded off their first season with a seventh-place finish in Division III. As for future plans, Emmons says the corps plans to "just take it one year at a time" to ensure that the organization grows within its means and can continue bringing rubber shark's heads and giant yellow bananas to football fields for many years to come.